Here they are, in much more official capacity – though still not official “official.” You can see this for yourself over at TV-Nihon were a forum member posted the pic. *The vest element so prominent in the Dairanger design is mirrored by what I’m going to call the “jacket” element, and the color scheme is basically the same, just reversed. *The standard color scheme stays: historically, green (an original color) and black have swapped inclusion on the main team lineup – in the just the last 20 years (21 shows), each color has main teamed exactly 10 times apiece, including just one concurrent inclusion (Go-Onger) and two shows with neither (Hurricanger /Gekiranger). *There also appears to be an insignia unique to each ranger (probably denoting the animal spirit) on the chest similar to enough past teams that I won’t list them here. Finally, based on Takenoko’s translation, I gather the name of the show means something along the lines of “Heavenly Equipped Star/Planet Protectors” or more to the point, “Heavenly Armored Celestial Guardians” (my localization). 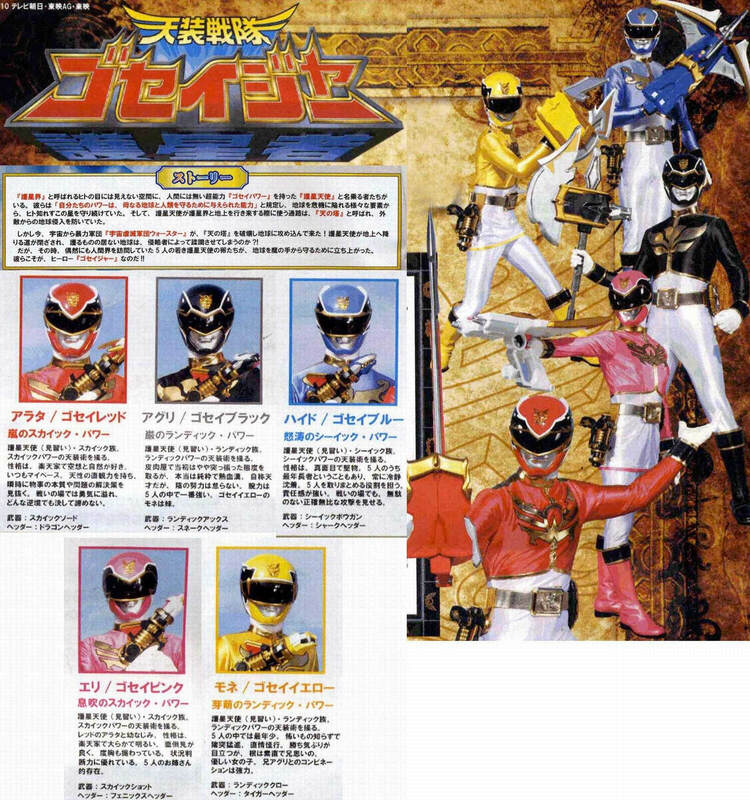 As you may guess from the title, and from the promo translation, there seem to be some close thematic similarities to both Zyuranger and Dairanger (assuming you have some familiarity to these shows). Again, this pic seems to be an official promotional poster(s). I would still treat this as “rumor” material, but there is now some real weight behind what we have here compared to the the stuff I posted earlier this week. Head over to TVN for more and be so kind as check back with Henshin Justice and the new Gosei rumor thread as I’m too lazy to report on the discussion there. I must say, now that the year is winding down, I’m feeling a little sad that this year’s Super Sentai is winding down as well. Tensou Sentai Goseiger premiers Feb. 14, 2010.